#26- Lynette from Get Your Craft On. Please email so I can get you in touch with Designer Blogs! Thanks to everyone who entered. ~The directions to make an adorable Cupcake Tote are easy. Looks like it can be easily tailored for other holidays. 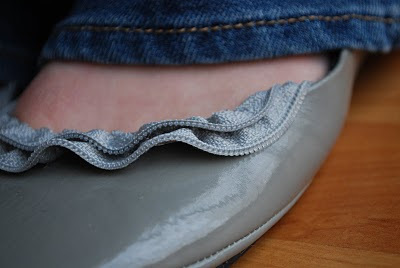 ~Linda shared a photo of her latest shoe revamp creation...zipper ruffles! I likes it. ~Morning T's World Tour Wine Tasting recap...this girl knows how to throw a delightful party! ~Speaking of chocolate, if you head over to see Kate at Centsational Girl, she'll show you how to make your own Sweetly Packaged Chocolate Candy. Her gorgeous photos will have you drooling in no time! 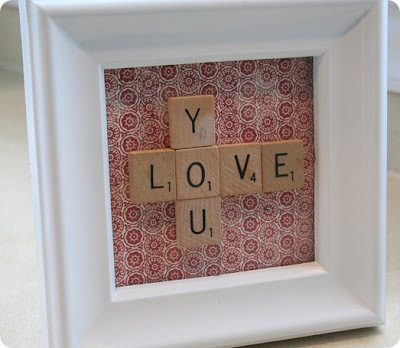 ~Melissa had a sweet Valentines Day craft featured this week...great if you're tired of your Scrabble game. I know what's going on my Spring yard sale list. ~If you're a LOST fan like me, you'll love the video posted over at Sussing Out LOST. This one contains a bunch of clips with all of the nicknames Sawyer likes to use. ~Jen shared a tutorial on how to make burlap napkin rings over at Tatertots and Jello. Fabulousness!! ~Richella's beautiful Love (actually) post this morning brought tears to my eyes, but a smile to my heart. Please read it! 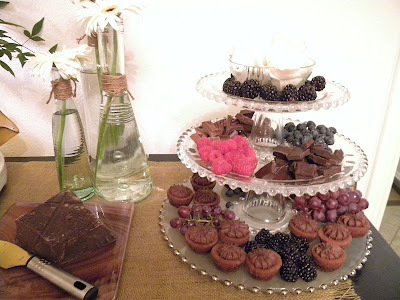 ~ If you missed the Decorating Dilemmas party, head over and have some fun playing design consultant. The girls and I have an impromptu Valentines Day party/playdate/lunch to attend this morning...they are so excited to get out of the house. Another birthday dinner, some more laundry, and some time spent with a good book round out my weekend. Hope yours is great! Burlap napkin rings?? I haven't seen this post--thanks for the link! I'm so glad to hear that you're going to a playdate this morning. . . that must mean that you can actually get out of your house and navigate the streets up there! How much snow did y'all end up with? Those crafts are all so super cute! I love your Friday features. 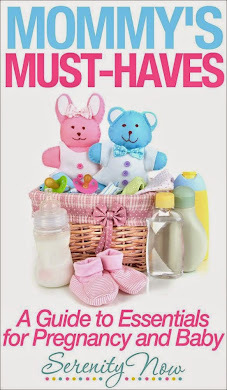 It's so much fun to go to a new to me blog to see a cute idea. Will T go back to work this coming week? I hope he's feeling good and all healed up by now. Congrats to the winner of your fab giveaway! I can't wait to check out the blog posts you mention (loving those ruffle/zipper flats) and thank you SO much for including my wine tasting post. Unfortunately I'm always so rushed before those things that I don't leave enough time for photos so I was disappointed in the quality AND I didn't get pics of any of the yummy food. Happy V-Day weekend to you Amanda. How did you get the image of the random.org results box? I've tried to do that but never figured it out. Congrats to Lynette, she is one lucky lady! Jen, Melissa and Amanda's crafts were 3 of my favorites this week too. Hope you have a fabulous (relaxing) weekend! Congrats Lynette!!! I loved all the blog tips! Inspiring for sure. Sounds like you are going to have a terrific weekend. We are doing a Valentine's Day brunch so that should be fun. Amanda...I am so loving those zipper ruffles! So cute! I love the new look for your blog...feel like I am so behind and lots to catch up on. I will be back into the swing of things with all my bloggy friends very soon! I have missed you and so glad everything is going so well! Wishing you the best Valentines day ever! Thanks for the great links! Wonderful links, loved Richella's story. Thanks for the love ! I LOVED Amanda's embroidery hoop letters! And I'm going over to check out that cupcake tote! The Book. With My Face. 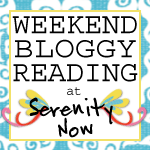 Extreme Blog Makeover : Giveaway! Raise Your Hand if You Can't Go to Blissdom!